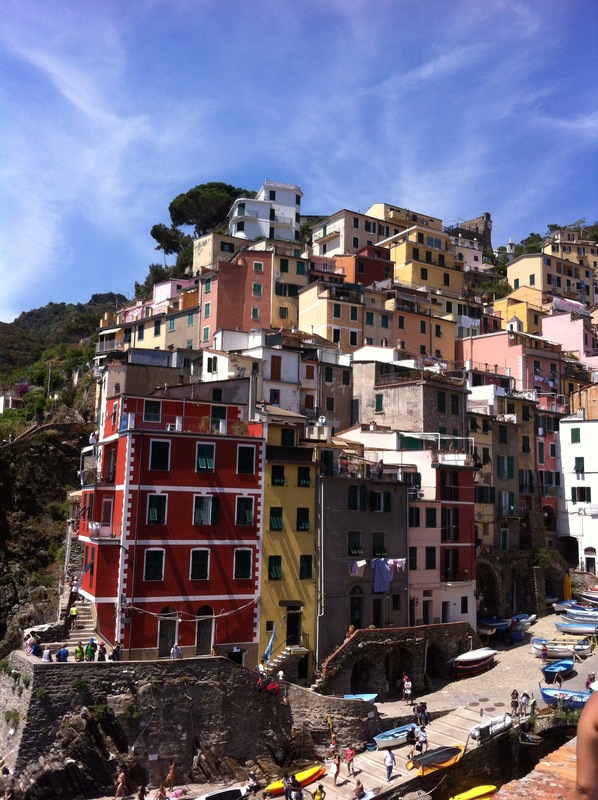 The Cinque Terre are five coastal cliff-side villages on the Italian Rivera. Isolated in the past, they’ve been pushed into the modern world by the train that now connects them to the outside and each other. 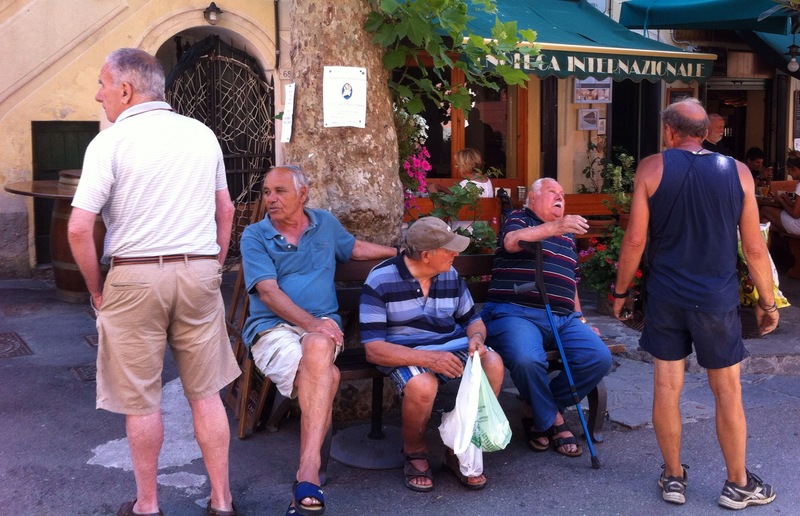 Thanks to stories by Rick Steves and others, they are overrun with tourists. But you can still see glimpses of the old ways, especially when you observe in the early morning or evening. Women shop for food every day in the small markets dotting the steeply climbing streets. The fruit and vegetable bins outside the shops are full in the morning, and grandmothers in house coats check over the produce. Fashionably-dressed twenty-something moms push kids (up to five years old) around in strollers. The steep streets would be too much for the little ones to manage, and the strollers are handy for packages. In one scene I witnessed on the cobbled street, mother and tot met grandpa. Accompanying much happy squealing, grandpa took the tot on his shoulders and whisked him down the street while mom continued to shop. The shops have a dozen breads in different sizes behind the counter. You tell the shopkeeper what size you want and she picks one out: “Si?” “No, larger (or smaller).” There isn’t the variety we have at home: sourdough, rye, raisin. The only difference is the size. I saw one guy carrying a loaf as large as his torso! Wish I’d gotten a picture of that. 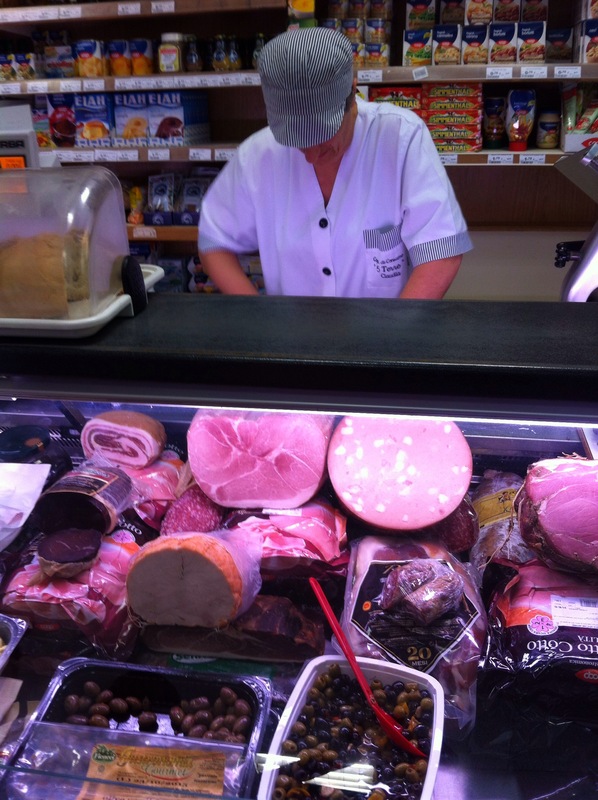 My daughter loves the prosciutto in the shops – several different kinds. When I tried to buy a half kilo, the shopkeeper said, “No – too much. How many slices?” So I bought 14 slices, cut as thin as I’ve ever seen, and costing a reasonable €3.77, even though it’s €29.00/kilo. Of course the way we eat it, we were back for more the next day. Likewise with our daily bread, juice, lettuce, tomatoes, carrot and cucumber, just like the locals. The girls discovered pear juice here and drank it for the rest of the trip. The shops are open in the morning, close at 1 pm, and open again from 5 to 7:30. 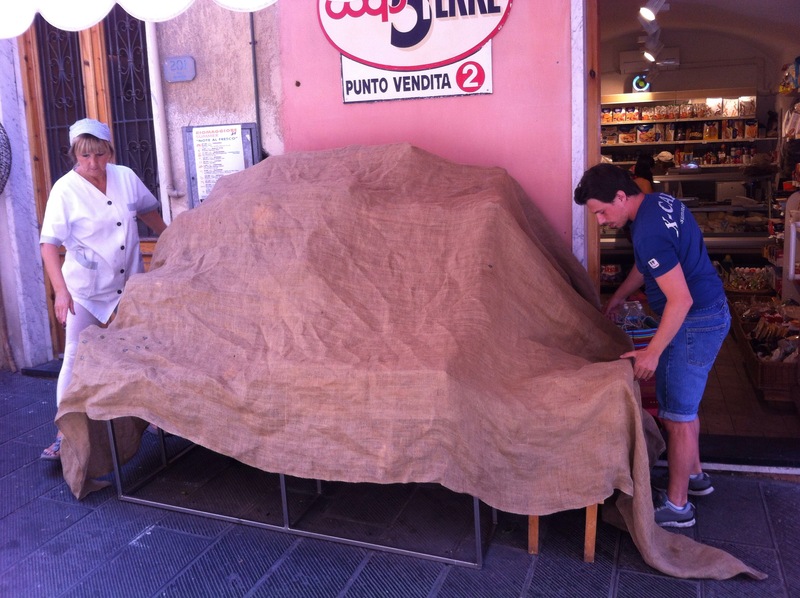 They cover the produce outside in the afternoon and presumably go home for a nap in the heat of the day. That’s what we did anyway. It’s just too hot to huff and puff up and down the hills. 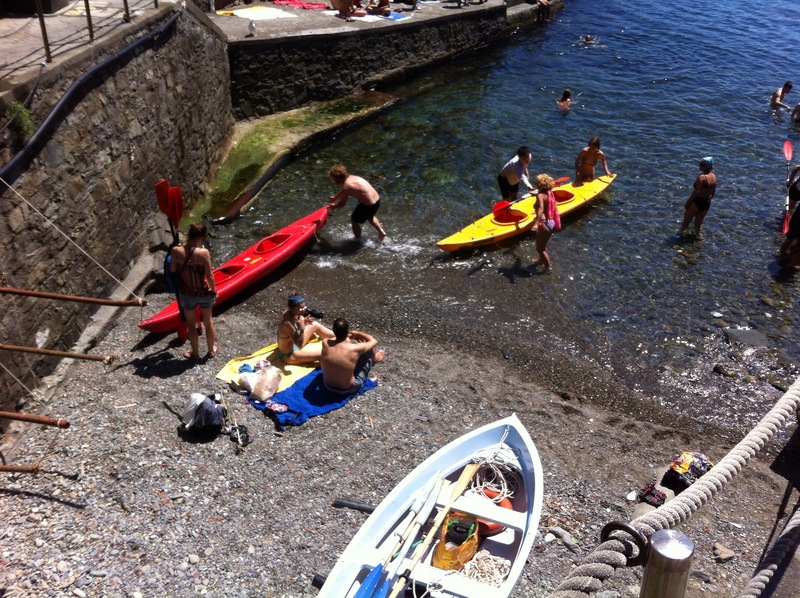 Swimming is an option, though our town, Riomaggiore, has only a sliver of a stony beach. 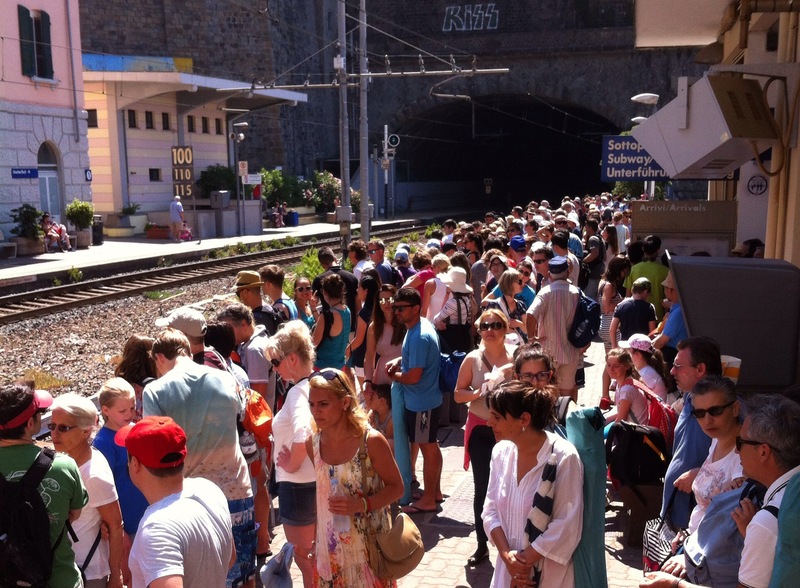 Everyone takes the train to Monterosso when they want to be seen sunning and swimming. Interestingly, we saw no shells along the Ligurian Sea (the Italian Riviera), while the beach along Lido Island just off Venice and on the Adriatic Sea were full of them. In Venice we noticed that the townspeople strode about with vigor and purpose. Here they are content to sit in the shade, especially in the afternoon. 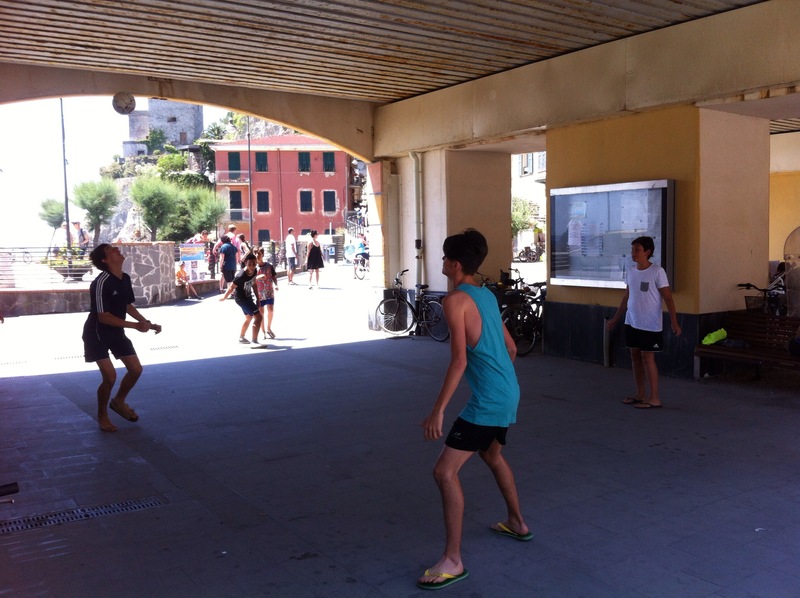 The old men gather to tell stories and the boys practice soccer moves in the shade of the train bridge (Monterosso). 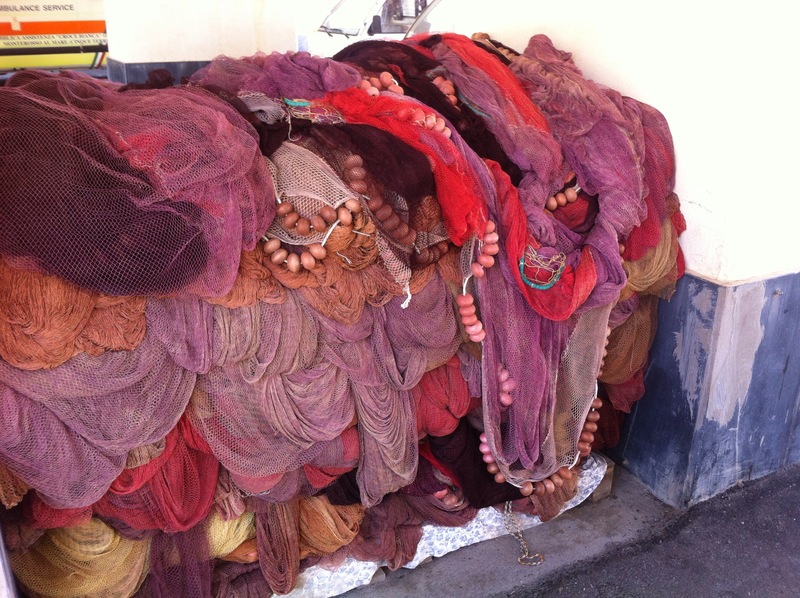 Afternoon is also a good time to hang out the laundry to dry. 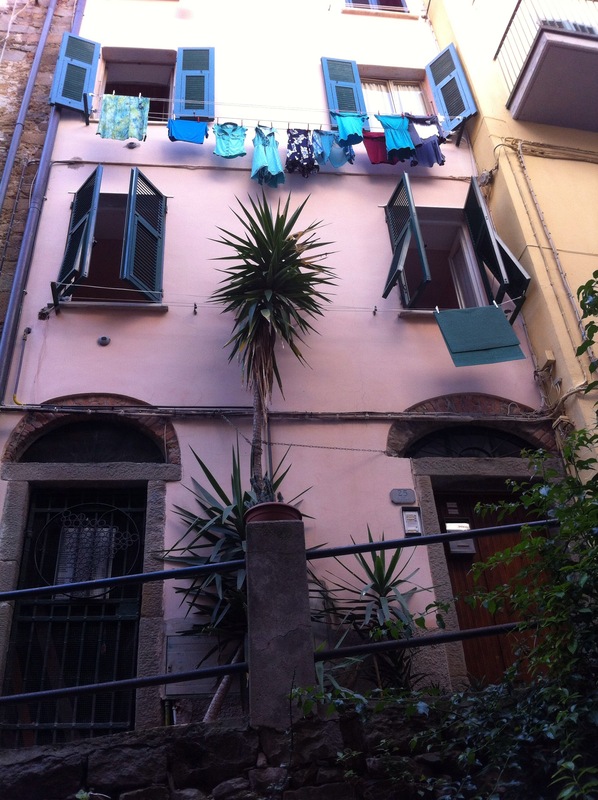 Laundry on the line is a very public display of a family’s activities and status. I know that the people across the way went swimming and the family in the next building have a baby. 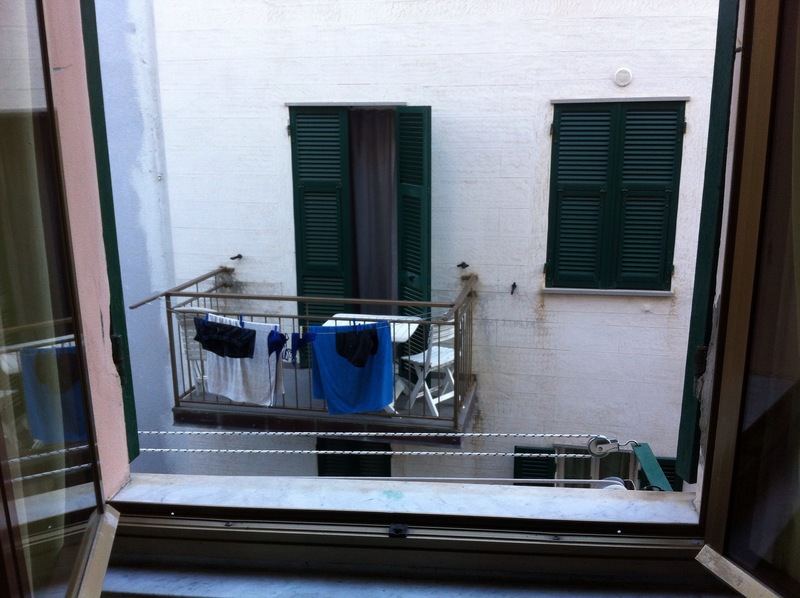 On our first day here, the lady upstairs chatted with the woman across the way as she hung sheets to dry. Even we got good at it. 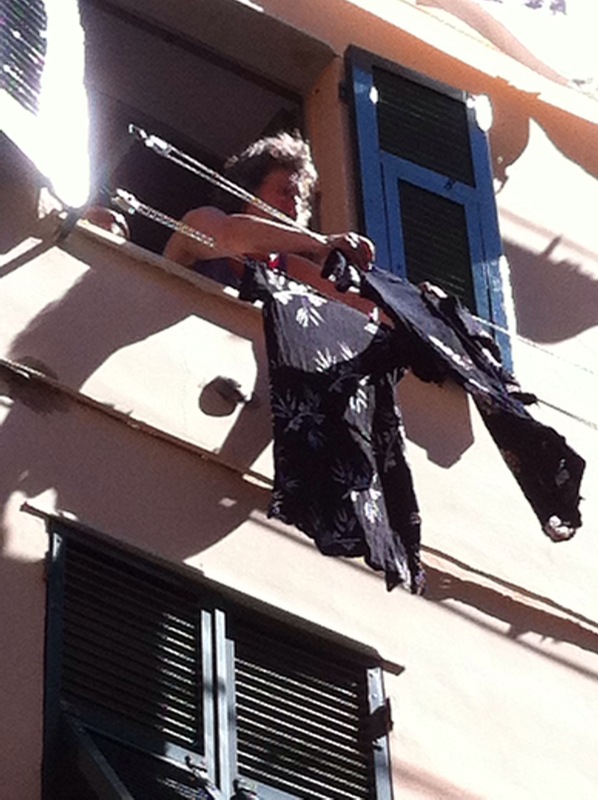 We dropped a clothespin or two the three stories down to the pavement, but never lost a piece of clothing. One morning my athletic daughter asked me to hike up to the edge of town with her to view the terraces. We could see neat gardens, grape vines, and trees that we assumed were olives. These were hard to tell at a distance. 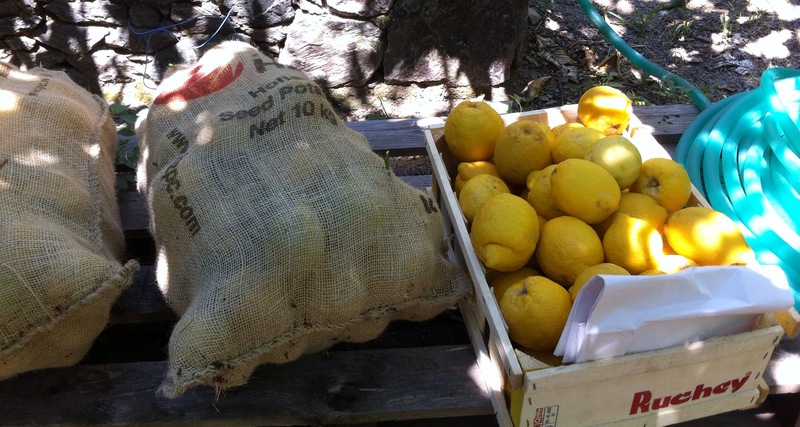 But easy to discern were the lemon trees everywhere. As we climbed, we found a lemon garden with the gate open. So we tiptoed in a short way. 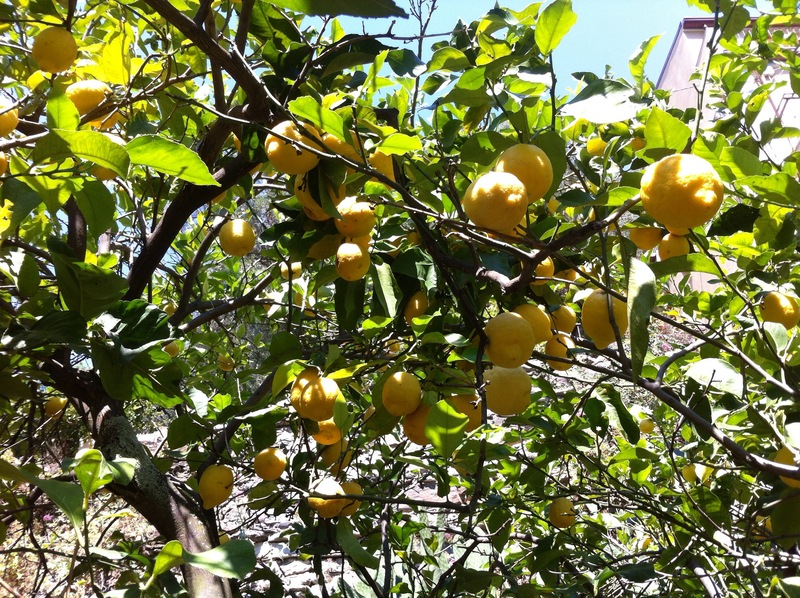 The overwhelming scent of fresh lemons filled the air. 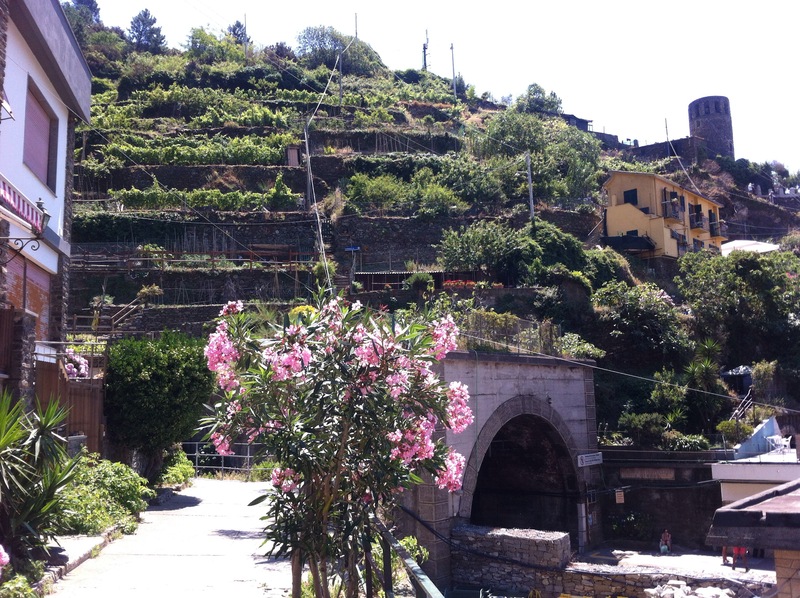 Riomaggiore is enjoying a bountiful season of lemons, evident here in the garden, and at the town markets – a great example of the rich history of farming and fishing in these villages. This glimpse of living the old way intrigued me. But I wonder how much longer the townspeople can retain it. Tourists, of which I am one, are choking these little villages. The main streets are full of people pushing and trying to stay with their parties. The train station platforms are even worse. Trains arrive only every hour or so. (It is hard to tell. There are two sources of train times: a large posted sign on the platform and a small schedule that is handed out. They do not always agree or maybe it’s that the trains are late.) Given the paucity of trains, the crowds mob the open train doors; not everyone gets on. Tourists are overwhelming the transportation infrastructure, garbage services and everything else. I hope the people who live here can find a way to keep their lifestyle for as long as they want it. 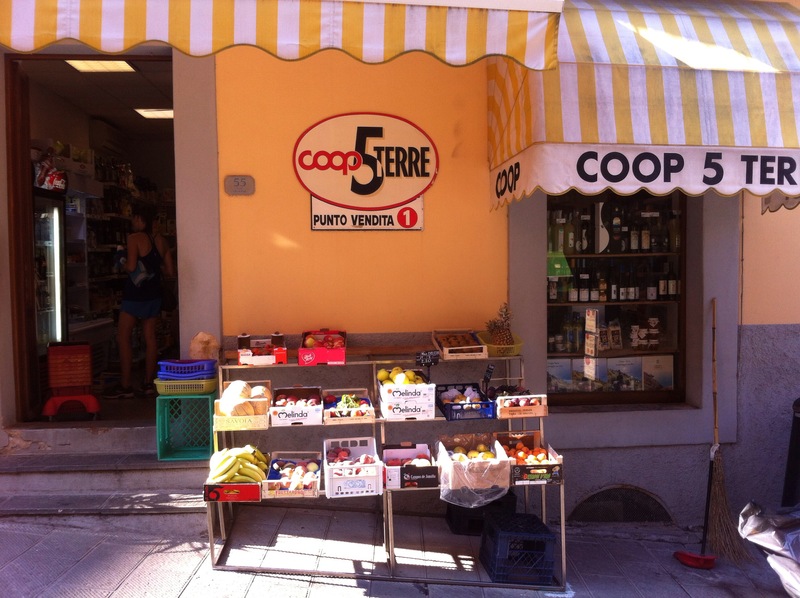 Planning your own trip to Italy? 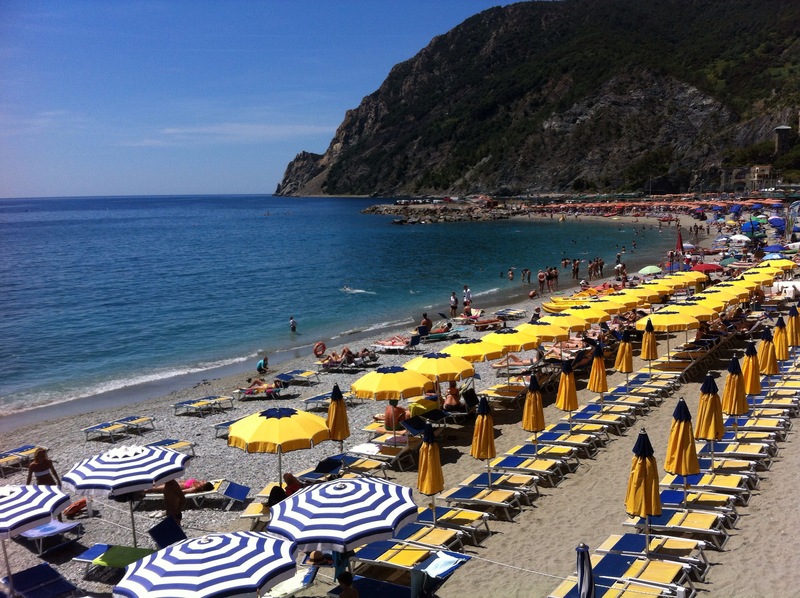 Get my Italy travel tips and my recommendations by clicking here, and send me an email with Italy Travel Tips in the subject line. I’ll even send a sample itinerary. Ciao! This entry was posted in Being present, Honoring tradition, Travel, Using my transformation tools. Bookmark the permalink. I am loving these posts and photos, Diane. Thank you so much for taking the time. They are bringing back pleasant memories. I am sorry to hear about the effects of the easy train access. I guess I better get over there sooner rather than later. Try some other season than summer. I’m guessing there are fewer tourists then. Thanks Malia for your comments. These are what keep me writing- that and the fact that I can’t help myself.